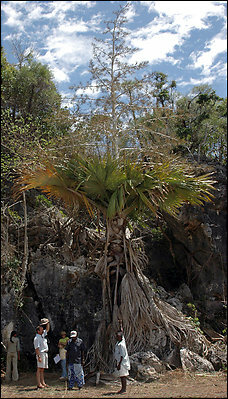 A New Palm Was Discovered. It Was Named Tahina Spectabilis. Seeds Were Gathered and Taken to Germany. From Germany They Traveled All Around The World. Ten Seeds Traveled 1800 Miles Across The Atlantic Ocean. Then 3000 Miles Across The United States. The Hawaiian Islands, On The Island of O`ahu.